When you first look at the PhotoCross 13, it comes across as a sleek messenger bag. The single main strap is wide and webbed, as well as shaped to wear nicely over your shoulder. I did find that once the bag is loaded up, you’ll want to cinch the shoulder strap tight for best wearing. When you need to work out of the bag you’ll probably need to loosen it up a bit. Fortunately, the cinch for the shoulder strap is reliable and easy to use with one hand. There is also a waist strap for extra stability. are lousy for setting down bags, so having one you can work with on your shoulder is essential. The PhotoCross 13 is remarkably versatile. The main compartment uses the familiar Velcro-fastened padded dividers to split up as needed. By default it has three sections. For pure photography, I place my Nikon D7500 with small lens in the middle section, and my Nikon 70-200mm f/4 lens in one of the other two. That left the third for either a flash and some other accessories, or a crushable jacket for changing weather. There is a separate, padded, pocket for a tablet or small laptop. There is a net covered zipper pouch on the inside of the lid to the main compartment. It’s useful for cables or small accessories. There is a front pocket that has plenty of space for cards, other cables, business cards, and other small personal items. A generous water bottle pocket lives on the side. When you place the bag over your shoulder, it can turn a bit upside down, so you’ll want to use the well-designed drawstring to keep it battened down. 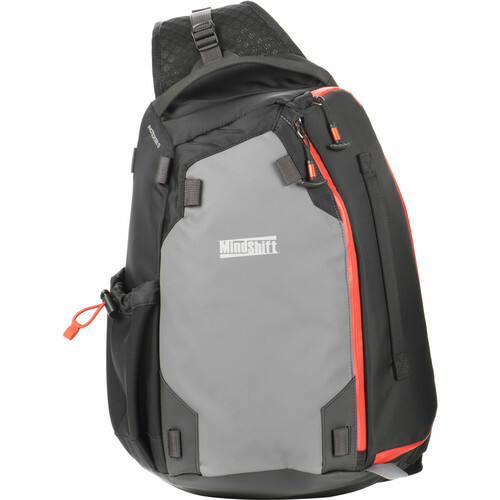 The bag also comes with MindShift’s excellent tripod straps, that can be placed in one or both of the prepared locations at the top and bottom of the outside. As usual, I hardly used them for a tripod, but they are excellent for stashing a sweater or jacket. The PhotoCross 13 is aimed at folks on the go, so it isn’t the answer if you need to stuff a huge DSLR or a bunch of full-frame f/2.8 lenses into it. I wouldn’t want to use it with a DSLR much larger than my Nikon D7500, or even with a similarly-sized DSLR with an L-plate. The bag has nicely-sealed zippers, and looks pretty weather ready by itself, but it comes with a rain cover that is pretty easy to put on, and easy to work with once it is on. Of course, the most important thing is how it worked in rough conditions. I used it as my camera bag in the surf, the mud, the sand, and on the marshes. I was able to do what I needed without setting the bag down, and without accidentally dropping things or having them fall out of the bag. The best thing about my Mavic Pro drones is that they are amazingly portable. That means I can bring one with me in the field and launch it when and where needed. However, I’ve still got to carry them, and I’d like to carry a camera as well. Fortunately the PhotoCross 13 provides a good way to do just that. I can put my Nikon D7500 with small to medium sized lens in the center compartment, my Mavic Pro in one of the two side compartments, and the RC, spare battery, and tablet mount in the other. My tablet goes in the laptop slot, with cables in the zippered top pocket. My PolarPro ND and Polarizing filters go in the front pocket, along with extra propellers and other small things. I can also cinch a rain jacket onto the outside, just in case. 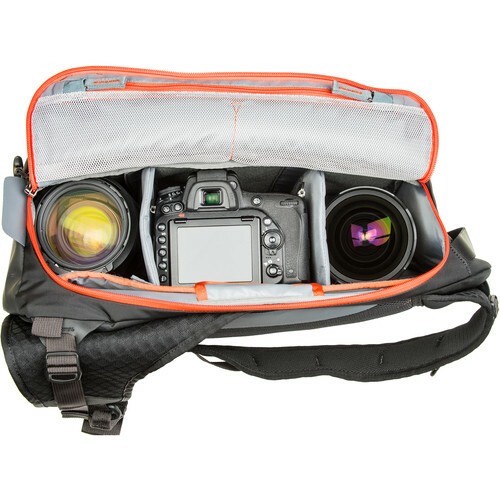 Earlier this summer I reviewed the excellent Think Tank Turnstyle 20 Sling Camera Bag. In many ways it is very similar to the PhotoCross 13. However, it is a little bit smaller, so you wind up with about 2/3 of the space in the main compartment compared to what you get with the PhotoCross 13. The tablet pocket is also just that, for tablets. You probably won’t be able to fit a laptop in there. But if your Mavic Pro kit is minimal, and you only need a small camera to go along with it, it is super-sleek and only $99. The TurnStyle is also missing the water bottle pocket and the loops for tripod-holding straps. You can pre-order the PhotoCross 13 from B&H for $129 (in gray or a spiffy black with orange trim), or snag the TurnStyle 20 Sling bag for $99 (in Charcoal or a more-stylish Blue Indigo). 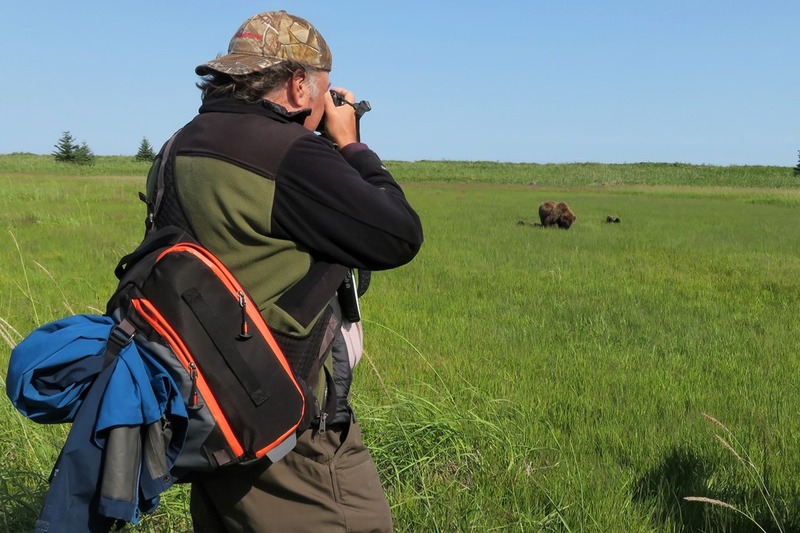 The PhotoCross 13 is a perfect field bag for a second camera and accessories for trips like our Alaska bear & puffin photo safaris, and would still be at home in a more traditional setting like the towns, temples, and markets of our Myanmar photo tour in December. In particular I think the low profile would be excellent for when we are navigating through tight or crowded markets.